Are you looking for Wild West theme hire? 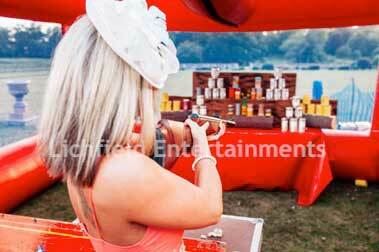 Well then look no further, Lichfield Entertainment's offer a variety of Wild West theme games. All of the games below can be hired either individually or alongside a Rodeo Bull or children's Rodeo Buffalo. 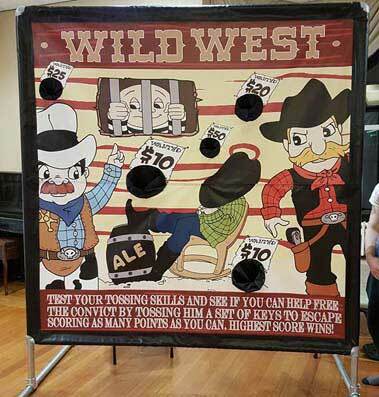 Hire more than one Wild West theme game and we will give a discount on the full hire price. Cowboy or Indian? 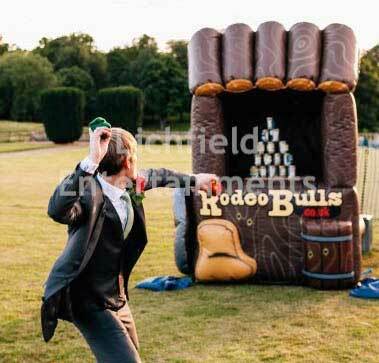 Its your choice with this great inflatable shooting range designed to our own specifications and especially developed for use alongside the Rodeo Bull for that extra Wild West fun. If you're a cowboy you try to shoot the cans off the range, and knock down the targets with cork guns. If you're an Indian you do the same but with a Bow and Arrow. This inflatable shooting range has been designed with safety of paramount importance and the range is fully enclosed to prevent stray arrows and corks escaping! The shooting range requires an overall operating space of 18x15ft and height clearance of 9ft. This game is suitable for pretty much all ages. Hire today! A wild west themed inflatable shack containing a stack of tin cans. Can you knock them all down with three beanbags? Throw the keys into the target holes and help break the convict from jail. 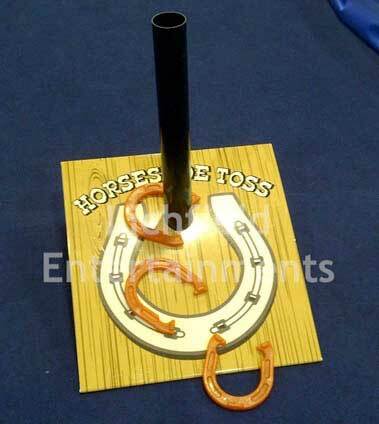 A simply game of throwing the horseshoe and trying to get it around the centre target post. We say 'simply' but its not that easy! 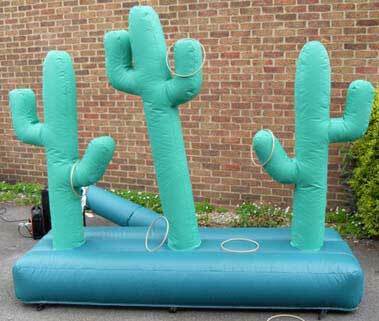 Throwing game where the idea is to try and successfully throw your wooden hoops over one of the inflatable cactus arms. So what are you waiting for? Hire your Wild West theme today and get your party started in the right direction. For a quotation please contact us with details of your event together with the numbers to be catered for and whether you'd like the item staffed or not. If you have any queries, questions or would like to make a booking, please click here to enquire and we will do all we can to help.